Article: Nickelodeon’s “Every Witch Way” Cast Set To Take Over Nick Radio! See The Schedule Of Events Here! All the magic, spells and excitement in Nickelodeon’s highly-acclaimed, hit TV show, Every Witch Way has taken over our TV screens and everyday we all can’t get enough of these spectacular Every Witch Way episodes. Starting the week of January 26th, the Every Witch Way cast will not only be taking over our TV screens but they will also be taking over Nick Radio! How awesome? 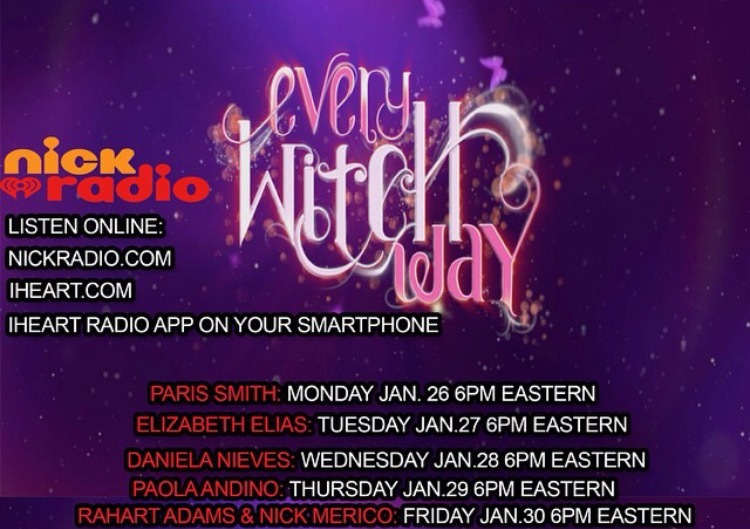 Every Witch Way cast-members: Paris Smith, Elizabeth Elias, Daniela Nieves, Paola Andino, Rahart Adams and Nick Merico will be taking over Nick Radio and will take on the role of your guest DJ for the night. What tunes will the Every Witch Way cast play on air? You’ll just have to tune in to see! DJ J. Boogie shared the photo above through his Instagram account and wrote, “BREAKING NEWS!! EVERY WITCH WAY taking over Nick Radio next week! Tune in to hear your favorite EWW stars taking over as guest Dj’s !#EveryWitchWay #NickRadio”. Check out the schedule of events below and you can listen online next week on NickRadio.com, iheart.com, and on the iHeart Radio app on your smartphone! Comment below and tell me – will YOU be tuning in to the Every Witch Way cast’s Nick Radio take-over? What songs do YOU want to hear them play on air? Previous Article: Sander van Doorn, Firebeatz And Julian Jordan Give A Preview To Their New Track, “Rage”! Listen Here!